Congratulations to our Academy Girls for taking third place in Kitchener and bringing home bronze this past weekend! Following hard fought losses to The Mavericks and KW Inferno, the girls won their last two games including a 13-0 shutout in the bronze medal game. This was the first out of town tournament for many of the girls, so it will be a memorable one! The Academy Boys also squared off in KW bouncing back form a tough opening loss to finish with a 2-3 record. The two subsequent losses were by a combined three goals, illustrating just how much the boys learnt as they played through the weekend. Congrats boys! What a start to the Ontario League season for the Academy Boys! Traveling down the 401 to compete at the Mavericks hosted tournament in Etobicoke, the experienced Titans squad had a great tournament showing everyone present they are ready to challenge this year. After convincing first round wins over Mavericks Red and Hamilton the boys were seeded with defending Provincial Champs Mavericks Black and Saskatchewan for round two. Needing at least one win in round two to play for gold, they followed up a hard fought loss to Mavericks Black with a tight win over the very skilled Saskatchewan team. The 7-6 squeaker allowed them to move on to the final where they once again faced off against Mavericks Black. While the boys came up short eventually falling 13-6, they came home winners with silver around their necks. Thanks to the Mavericks for such a well hosted event and Congrats to the boys and Coach Blake! Nov 13th, 2017 - Ottawa Titans recognized by the Ottawa Sport Council! Seven U16 Titans girls (Abi, Ana, Ivana, Julia, Rokaya, Taylor and Teodora) met their new teammates in KW on September 23rd and 24th. ‎They had 4 hours of coaching with Paul ( U of T women's WP coach) plus a crew of three other talented coaches. The girls had a team dinner and team building activity at a KW escape room. Coach Owen couldn't make the first trip, but collaborated with Paul on team decision making. The girls had a number of full scrimmages and profited from the high caliber of play and coaching. A great start for a new collaboration! The girls will have one more practice in KW on October 21st and 22nd and be billeted again with the KW parents. Coaches and players are looking forward to the first round of matches in Montreal in November. This was our 3rd Green Team Army Run event, and the experience proved once again to be a great opportunity to promote the sport of water polo and our club to the general public. Aside from the recycling success, we have been able to demonstrate our commitment and dedication to this initiative. Our booth presence (Friday-Sunday) was supported by ~10 volunteers. Sunday morning's engagement was a great team building effort with about 50 members present, and was an opportunity for parents to demonstrate leadership to the younger members of the Green Team. There were many brand new Titans members working together with some well known faces who keep coming back and enjoying the experience. A big thanks to all athletes and parents, who participated and contributed to this success, and congratulations on a job well done to our Green Team coordinator, Boris Dzerdz. Sept 20th, 2017 - Academy (U14) Growing by Leaps and Bounds! What a sight to see the explosive growth in our U14 Academy program this September. Tremendous recruitment and fabulous coaching in our recreational programs has driven Academy to record numbers. With over 60 athletes registered including 20 girls, the Academy program is nearly double the size it was a year ago. The first training session on Monday Sept. 11th, saw over 50 players in the pool and 6 coaches diligently working with our young athletes. Congratulations to everyone who helped make this happen! How do you say good-bye to your favourite coach after 4 years? Why not challenge her to swim a 3 km open-water race! This is exactly what our U16/18 girls did with Rachel Stein in July before she left for Baltimore. Due to the summer holidays only Alicia Morewood, Lianne Bedard, Julia DeCaire, and Juliana Morewood were able to challenge Rachel at the 3 km “Bring on the Bay” race held in support of the Easter Seals (helping kids with physical disabilities to succeed) on July 15, 2017. With the designated pink bathing caps (Lianne was thrilled), goggles and time chips tight around their ankle, they felt like research animals released into the wild when they entered the water. Rachel rose to the challenge and beat all her “little girls” with an impressive finishing time of 53 minutes. Only Alicia who will miss her not only as a coach but also as a team mate would not let her out of her sight. Rachel knew her girls so well that she predicted that all the U16 girls would finish within 65 minutes, which is exactly what they did! Well, done girls! Rachel you will be greatly missed and YES they promised to be nice to Owen and Yorek in the upcoming season! All members (athletes and parents) are welcome and invited! The Ottawa Titans Water Polo club is looking for an energetic, outgoing person to join our team and support our operations throughout the 2017-2018 season (September 1st, 2017 to August 31st, 2018). The club is growing in leaps and bounds and now requires an individual to work on a part-time basis in support of certain club operational requirements. Job post information is available within this document. 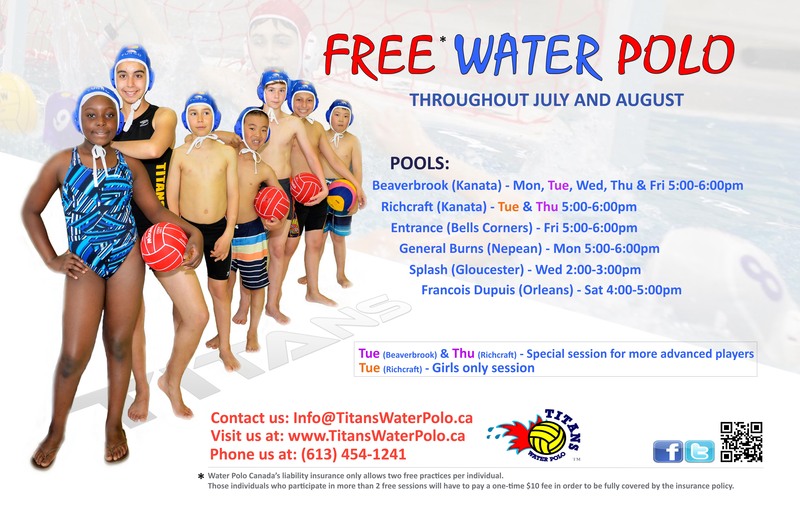 Interested candidates should contact info@titanswaterpolo.ca not later than Sunday, August 6th, 2017. Carleton Recreational Summer Water Polo League (ages 14 and up) – details available here. Free water polo sessions offered to young girls and boys (ages 5 and up), across the city at outdoor and indoor pools – details available at this page. 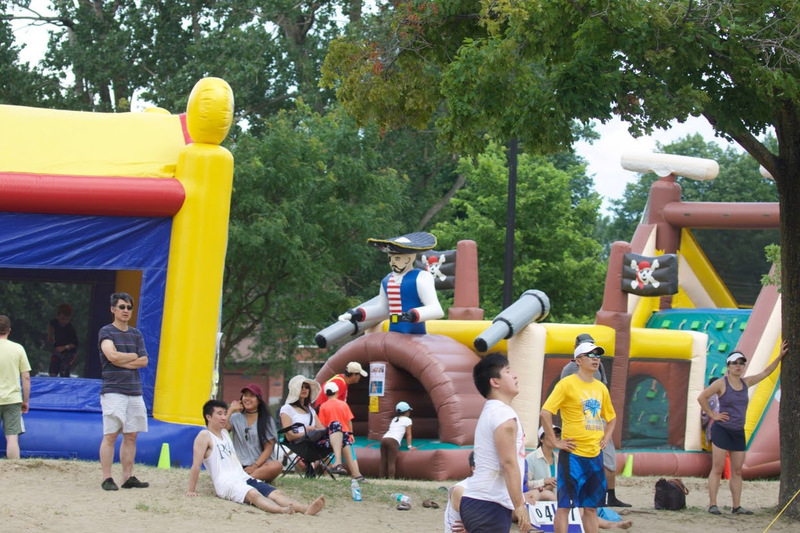 Summer version of our 'Swim and Play' program (ages 7 and up). Quick overview is available here, the activity insight outlined on our main Programs page. Two Stay-in-Shape programs in June for ILWP (I Love Water Polo) and competitive (U14 and up) athletes. June 10th, 2017 - Titans Award Banquet is Culmination of Great Season! The Titans held their annual Awards Banquet on June 10th, and used the opportunity to recognize another great season by all the Titans athletes. While those below were recognized in particular, all of the Titans athletes should take great pride in their hard work and dedication. Special thanks to Banquet Coordinator Peter Bujduveanu who put in lots of hours of long work to ensure the event was a success. Thanks as well to our MC Bosko Vukojevic, as well as to the coaches and special guests who were present and helped distribute the awards. Go Titans! May 30th, 2017 - Two Titans named to the Men's U20 National Team! It is a great pleasure to announce and congratulate the following athletes who've made the travel list for the 20U Men's National Team. All athletes will be invited to travel with the 20U Men’s National Team centralizing in Serbia and conducting joint training with various European Club and National Teams. For further information please refer to the resources present on the Age Group National Team Section of our Water Polo Canada website (http://www.waterpolo.ca/agnt2 016.aspx ). Please for this message to your clubs, parents and/or athletes within your region. Congratulations to our Titans who made the team, Bogdan Djerkovic and Aleksa Gardijan; Congrats boys, we have no doubt you will do the Titans proud! On May 27th and May 28th, the Titans sent an all boys team to the 12U Provincials at the University of Western Ontario in London. Saturday started off well with a 17-2 victory over KW Black, followed by a tough loss to eventual bronze medal winners Shadow 15-5. Sunday ended with an 8-4 loss to Mavericks Black, and a challenging game against Hammer finished their tournament with a 19-9 loss. The boys had a lot of fun, showed a lot of heart, and played well as a team, trying their best even when a win was no longer a possibility. A big thank you to Yorek for coaching the boys, and to Jason H. for acting as team manager for the week end and organizing a great team dinner on the Saturday night for everyone! 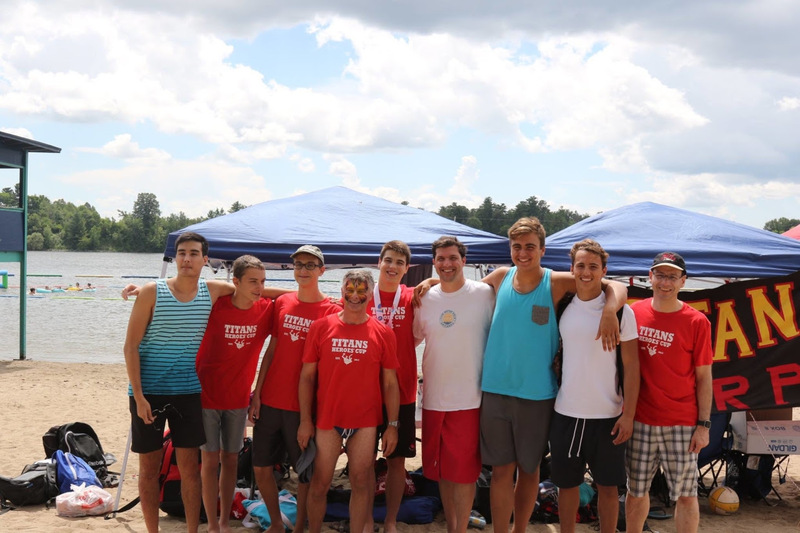 The Ottawa Titans Water Polo club is looking for energetic, outgoing persons to join our team and support our summer programs! Both of these are seasonal positions (between early June and late August) and you will have the opportunity to help with daily club operations in addition to contributing to our annual charity benefit – the Titans Heroes Cup. Our Summer Program Coordinator for Orleans information (French and English) is available within this document. Our Summer Program Coordinator for Kanata-Carleton information (English and French) is available within this document. Interested candidates should contact info@titanswaterpolo.ca before Sunday, June 4th, 2017. March 22, 2017 - In their First Year of Action, Titans ML Women's Team advances to Final Tournament! This is the first year the Titans have entered a senior women’s team in the National Championship League hosted by Water Polo Canada. A mishmash group of women comprised of former and current Titans, Carleton University alumni (one alumni from McMaster University) and one Senior National Team Athlete. Zoltan Csepregi, former Titan and former National Team athlete has graciously accepted the role of Head Coach. This group of women have grown up either, playing against each other or as teammates. The first game of the season was challenging as it had been a couple of years since most of them had been in the water. Sadly enough it did not end in a Titans victory. Following a weekend in Montreal (January 27-29), the women came home with a 1-4 record. Defeating Hammer 18-9, solid defensive blocking came from Caitlin Dean. Celia McClellan adding two beautiful cross net/top corner goals didn’t hurt. Alicia Morewood added one goal in the third and continued to play quality defense. Saturday, the Mavericks defeated the Titans 10-8. Quality goaltending and strong defense was not enough this time. To end the weekend, add 2 losses against CAMO (21-5 and 15-2). The ladies had fun none the less. The women’s team travelled to Toronto for a 4 game weekend (February 17-19th). Winning their first game against the Mavericks (9-7) set the tone for the weekend. Sarah McIlveen, only arriving mid-2nd quarter managed to put away 4 goals that game. Rachel Baxter added 4 and Michelle Caron (SNT athlete) added one. Goaltender Cassandra Thompson wasn’t letting much past her. She dominated in nets. From there, the Titans women continued to dominate besting Hammer 10-5. Again, Cassandra played an exceptional game in the net. Goal scorers Lea Catana and Jaime Bowen both adding one goal each, Sarah put in 3 and Rachel added 5 to the score. Those victories were however short lived. The women met CAMO once again, losing 23-2. With Rachel Baxter adding one goal to the score and Chanesa Ryan adding the other. Sunday morning, the women faced off against the Toronto Golden Jets, final score 12-6 in favour of the Jets. Titans coach and former goaltender Rachel Stein certainly displayed quality defense and the team reaped the benefits of a former goalies blocking skills. Sarah added the first goal, Michelle, Rachel and Chanesa behind her. Rachelle Aldrich put one away in the third and finish off the goals for the Titans. Unfortunately with all effort put forward the women did not walk away victorious. The team was set to play their final game of the season on March 18th however the other team has forfeited leaving the Titans with a 5-0 W. With 12 points the women advance to finals being held in Markham March 31-April 2. February 26th, 2017 - Another Titans Cup for the Record Books! Congratulations to everyone who participated in this past weekend's historic Titans Cup. The ever-growing event found the Titans hosting 8 clubs from 3 provinces with a total of 26 teams taking part in four different age divisions at 2 different locations. The size and scope of the event were only matched by the spirit of the competitors, the enthusiasm of the fans, and the dedication of the volunteers. The Titans had 9 teams across all divisions ensuring more than 100 Titans athletes had the opportunity to participate, many for the first or second time. This accessible and invaluable experience is one of the primary reasons for the existence, as well as success of the Titans Cup. It is a opportunity to spread the word about our sport and create goodwill within the water polo community. Specials thanks goes out to our Titans Cup Tournament Coordinator, Tetyana Galabis - a HUGE job very well done. Many thanks as well to all of our coaches and parents who worked tirelessly to make sure everyone had fun and everything went off smoothly. Coach Antonio, our Swim and Play Director, would like to invite all his Swim and Play athletes and coaches to join him at his Winter Fun Meet at the Pinecrest Pool on February 4th at 6pm. See the document below for more information. Come join your friends for an evening of fun! January 29thy, 2017 - Titans register 300th athlete of the s eason! After 4 ½ years of sustained recruitment efforts and innovation, the Titans have just reached a very significant membership milestone. Earlier in the month, we just registered our 300th athlete! This officially makes the Titans the largest water polo club in Ontario. In fact, approximately one third of Ontario’s water polo athletes are Titans. We could not have achieved this without all our members’ help, so congratulations and thank you to everyone, and let’s continue the hard recruitment work to reach the next milestone (400 anyone?). Nathan Breadner, an I Love Water Polo athlete, was “lucky number 300” and was awarded prizes to celebrate the milestone. Welcome aboard Nathan. Another great opportunity to see our Titans in action. Our U16 Boys will be playing National Championship League games in Gatineau next weekend, and you are all invited to come watch this great water polo and cheer our boys on! January 10th, 2017 - Bogdan Djerkovic is Ottawa Sports Awards winner!